At KDE sometimes we focus in the technical parts of Free Software. This is understandable since most of us are technical people doing a technical job. But KDE also has a huge social impact, thanks to KDE there's schools that can teach touch typing , there's people out there that can do their accounting, there's business that can fill their taxes. KDE does provide quality software for all the world to use, making it a better place for all of us. Donating to KDE is not for you, it is for the entire world. 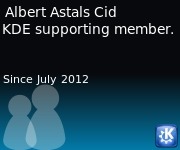 As a way to say thank you, starting with € 30 KDE e.V. will send a KDE themed postcard to any given address. You will get an extra card for every additional € 10 donation.